British Assyriologist. Born, Shirehampton 1845. Died, Bath 1933. Educated at Grosvenor College, Bath, then Queen's College, Oxford. Hibbert Lecturer, 1887. Gifford Lecturer, 1900-2. Professor of Assyriology, 1891-1919. 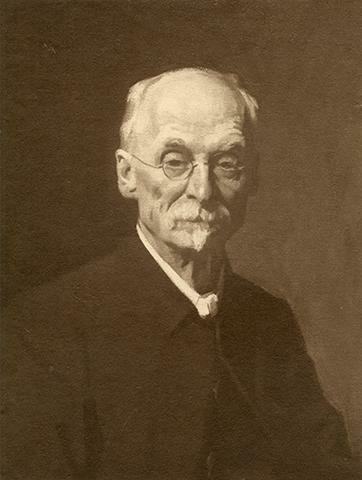 Rhind Lecturer, 1906. Huxley Lecturer, 1906. D.Litt. LL.D. DD. Specialised in Carian and Hittite languages, as well as Assyrian and West Asian archaeology and philology. Also worked in Egypt copying inscriptions, etc. Material other than photograph album probably with Professor J. Garstang at the time of Sayce's death. The photograph album was in the possession of Professor J. Garstang before being passed to Professor O. R. Gurney. Packet of correspondence presented by Professor O. R. Gurney. Photographs album and other papers presented by Professor O. R. Gurney in November 1987; the packet of correspondence probably handed over at the same time (info. Dr Jaromir Malek). The rest of the material was presumably presented by Professor J. Garstang in September 1949. Correspondence received by A. H. Sayce was deposited by him in the Bodleian Library, Oxford, in 1933. Contact the Bodleian Weston Library for access: http://www.bodley.ox.ac.uk/dept/scwmss/wmss/online/modern/sayce/sayce.html. Large group of papers, including notebooks, articles, essays, reports, lectures, sketches, photographs, tracings of inscriptions, correspondence, newspaper cuttings and other notes in The Queen's College, Oxford as part of the Library collection. Catalogue: http://www.griffith.ox.ac.uk/gri/SAYCE_MSS_in_Queen's_College_Oxford.pdf. Hand-copies by Sayce of Meroitic texts on vessels from Tomb 800"